Take a ride on the dark side! The Spartan® Windshield's stainless steel frame finished in stealth black powdercoat puts this full size windshield offering in a category of its own. 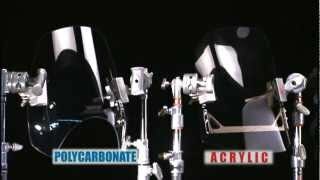 Spartan leads the way in high value/low cost, Quantum® hardcoated polycarbonate, quick release windshields for Harley-Davidson® riders! 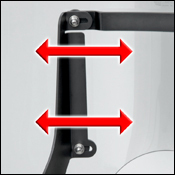 All Spartan® Windshields require a SwitchBlade Mount Kit, sold separately. You won't find a better quality touring-sized windshield at such a great price! The Spartan® Windshield has a stainless steel frame finished in a stealthy black powdercoat and looks perfect on today's dark custom bikes. 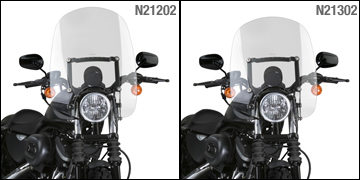 This full-size Quantum® hardcoated polycarbonate windshield comes in two heights – 18.50" and 16.25" – to fit almost any rider and offers excellent wind protection. 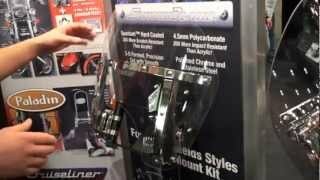 The windshield mounts to our trusted Quick Release Mount Kit with stainless steel hardware and rubber grommet compression limiters that spread the load for long life and durability. 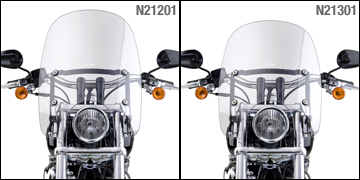 The Spartan® Windshield mounts to our Quick Release Mount Kit – the same hardware that mounts our well-known SwitchBlade® Windshields and our Wave QR® Fairings. Simplified fitments are made possible by the Spartan's patented parallel slotted tabs that easily adjust for a perfect, customized fit with different fork widths. 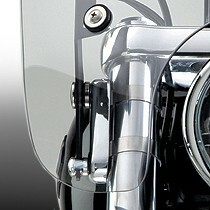 Quick Release Mount Kits are sold separately. High quality powdercoated steel and stainless steel will keep your Spartan® Windshield looking good season after season. 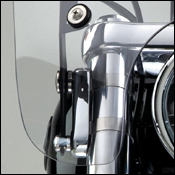 Best of all, Spartan Windshields feature our exclusive Quantum® hardcoating for the ultimate in scratch resistance!